I would like to introduce you to Laguna Coast Labels. We are a small WOMEN owned company. We have been in business since 1980 and located in Lake Forest, Orange County, California. In 1980 we started our business in our home selling medical supplies to hospitals. As we grew and moved into a building we narrowed our focus to medical labels for hospitals. We now sell to hospitals, veterinarians, churches and companies that need production or promotional labels. We are a small family owned business with dedicated employees to serve your label needs. We offer quality labels and our focus is on excellent customer service. We offer all types of labels for your needs- laser, thermal transfer, thermal direct, barcode, and custom printing. We offer low minimums and small runs in addition to our regular stocked labels. We offer out of the box solutions for your needs. We can do custom labels and have 4 color processing capabilities. In addition we can sell you ribbons and printers for your label needs. We are specialists in hospital medical labels for all departments: admission, medical records, nursing, lab, pharmacy, biomed, central, and others. We have a large selection of label sets for Medication OR labels and packs. We can supply them sterile and non-sterile. Please feel free to contact us at 949-455-2500 with any questions. Provide quality products with excellent customer service for our customers. We are committed do this efficiently, quickly, and economically and to provide label solutions for our clients. We strive to make sure we satisfy our customer’s needs so they will recommend us to others. 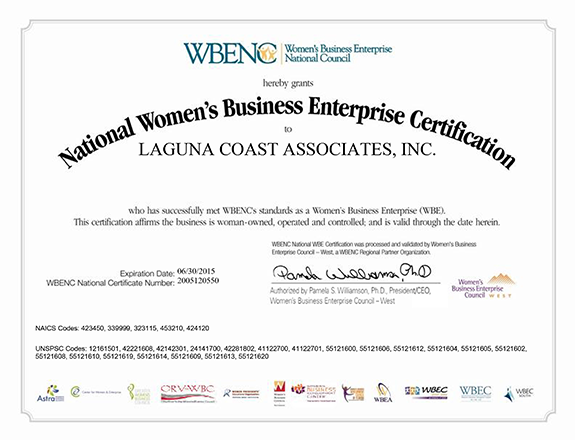 We are registered with the Women’s Business Enterprise National Council. This certification affirms the business is women-owned, operated and controlled. Laguna Coast has been in business for 35 years and woman owned for 15 years.